December 22nd is a very special day on every Spanish family’s calendar. 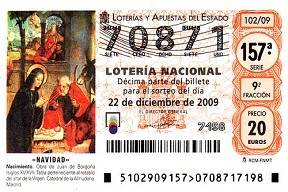 It’s the day of the Christmas lottery which is better known worldwide as ‘El Gordo’ … the fat one! The total prize money to be shared out in this month’s draw is €2.3 billion and thanks to a 15% chance of winning some sort of prize it is estimated that around 98% of Spaniards will participate in the draw in some form. A single ticket is too expensive for most people so they buy a ‘decimo’ which represents a tenth of a ticket and share any prize with the other holders of the same ticket number. You’ll also find that your local bar and shops have cheaper tickets on sale which are broken down into even smaller denominations so by the time the day of ‘El Gordo’ comes around people have at least one ‘decimo’ that they’ve often bought with their family and/or workmates together with any number of smaller ‘participaciones’ that they’ve picked up along the way in bars and shops. On average each person spends almost €60 on lottery tickets. If you’ve ever been in Spain on December 22nd you would be forgiven for wondering what on earth was going on. For up to five hours national radio and television broadcast the draw live and the whole country is focused on it as every television tunes in. The draw itself is quite bizarre. It is made by boys from the San Ildefonso Orphanage in Madrid who sing the winning numbers. Because of the way the lottery tickets are sold the biggest prize winners usually live in the same town and share the winnings of a single ticket. This might go relatively unnoticed in a big city like Madrid or Barcelona but what about when the winning number is in a small town? In 2011 the winning prize of €700 million went to the small town of Grañén in Aragón which has a population of under 2,000 people. In such a poor area of the country with massive unemployment prizes of €400,000 were handed out to winning ticket holders. Talk about Christmas come early! If you’re interested in having a go at winning a share of the world’s biggest lottery you can now buy El Gordo tickets online.